The Imo state Governor Owelle Rochas Okorocha has accused the Governor-Elect Rt. Hon. Emeka Ihedioha of impersonating him. 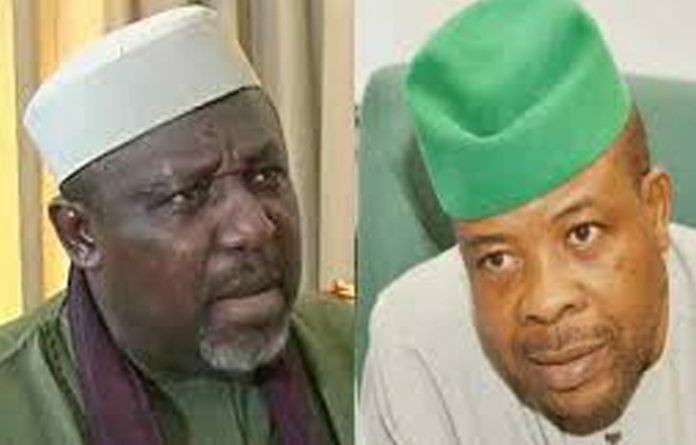 Okorocha who disclosed this in a press release he issued through his Chief Press Secretary Sam Onwuemeodo on Tuesday, further alleged that Ihedioha is acting as governor and conducting activities meant for sitting governor. He advised the Governor-Elect to maintain certain level of decorum a decency. “Owelle Rochas Okorocha is the governor of Imo State as we write and for Chief Emeka Ihedioha who was announced winner of the governorship election in the State by Mr. Francis Ezeonu led INEC in Owerri to be acting as governor and conducting activities meant for a sitting governor is impersonation. And he should be advised to maintain Certain level of decorum or decency. “Again, for Ihedioha to set up what he termed Transition Technical Committee of one hundred and thirty-nine (139) members and that of the Governorship inauguration Committee of three hundred and twenty-three (323) members making the total number to be four hundred and sixty-two (462) shows that he does not even know what the governorship of a State is all about. He therefore needs some tutorials in that regard. “In less than thirty minutes after the reported fire incident at the Imo Airport Ihedioha rushed to the airport to inspect damages caused by the fire and also issued directives to the management of the airport. Did he do that in his Capacity as what? “Is he the governor of the State? And the speed with which he rushed to the airport was suspicious, perhaps, he knew what caused the fire incident because as a PDP man, there is no part in any movie they cannot act, including acting like James Bond (007). “He was in the House of Representatives for twelve years and ended up being the Deputy Speaker of that Green Chamber. The PDP was also in Power in the State from 1999 to 2011. Yet, they could not erect one structure at the airport. It took Rochas Okorocha for the airport to be made International Cargo airport with all the needed facilities on ground at the moment. “Just yesterday being Monday, April 9, 2019, he issued a release with the inscription “Government of Imo State” on the paper, and threatening to close banks that do further transactions with the State government. Why can’t he watch other States where new governors also emerged. Why is he jumping the gun? Why the hurry? “He should be advised to be civil. And there is also the claim that he is behaving this way because he knows that he didn’t win the election and he is being threatened by the glaring fraud that characterized his declaration as the winner of the March 9, 2019 governorship election in the State. “Since 1979, a good number of governors have been elected in the State. His own Case won’t be different. He should take things easy. And wait until he is sworn-in which is few weeks from today.